Visiting the Palace of Versailles is something I can now mark off my life list. The Palace of Versailles is a royal château in Versailles that is located about 45 minutes by train outside of Paris, France. Today, Versailles (the town) is a suburb of Paris but in 1682 The court of Versailles was the center of political power in France. The royal family was forced to return to the capital in October 1789 after the beginning of the French Revolution. There are many things you can see while visiting. The grounds consist of The Palace, The Gardens, The Grand Trianon, and Marie- Antoinette’s Estate that included the Petit Trianon, Queens Gardens and the Hamlet. We were able to see the Place of Versailles, the gardens near the palace, and the Petit Trianon. At this point I was stuck with my macro lens (because my other lens broke on the trip) so I was working hard on the angles with thousands of people everywhere! 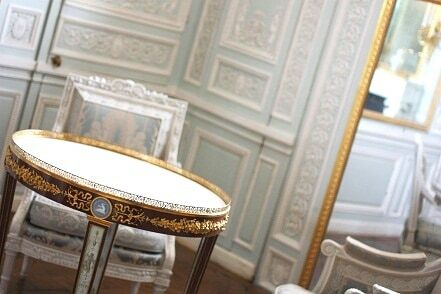 Here is Marie Antoinette’s bedroom in the royal palace that is right off the hall of mirrors. I wanted to show the top of the bed with the plum feathers and her chandelier. In that corner of the wall is a secret door that leads to the Kings chamber. Next time I would like to just visit the gardens with a picnic, which is what many people were doing. My mom and I really wanted to see Marie Antoinette’s abode the Petit Trianon. The Petit Trianon is a small château located on the grounds of the Palace of Versailles. After a quick skim of the Palace we popped into the gardens and caught a golf cart to the Petit Trianon. This was considered Marie Antoinette’s little getaway where she could leave all things formal and court like at the door. The home is amazingly simple compared to the Palace of Versailles but of course beautiful. Compared to the Palace the Trianon was much more relaxed but still very elegant. I also loved getting a peek at the place settings. Notice the difference verses what was used in the Palace. Much more colorful and fun. I found this tea cup to be really interesting with the band of feathers and the arrowheads. The kitchen blew me away because it felt a little modern day to me but of course rustic. We enjoyed our time spent here but we really needed more time to explore. There’s so much you can do here between the palace, gardens, fountains, and the Hamlet which we did not get to see. Now the Hamlet has been added back to my list. It was the last thing we tried to do and the kids were super disappointed (as you can see in the picture below). Giulia wanted to see the animals but they closed by the time we were heading that direction. My suggestion is to take 2 days to see Versailles. We ran out of time and it went by really quick. The other thing, get there early we arrived in the afternoon only because our train was having issues but we tried to get through everything that we could. The Petit Trianon and the Hamlet close up at 6:00 p.m. (18:00). I would probably start first at Maria-Antoinette’s Estate first then work your way to the Palace.